Tag Archives: Does Color Matter? Though I am mostly comfortable in descriptive paintings, occasional visions have compelled me to explore abstract paintings, such as this Schism. 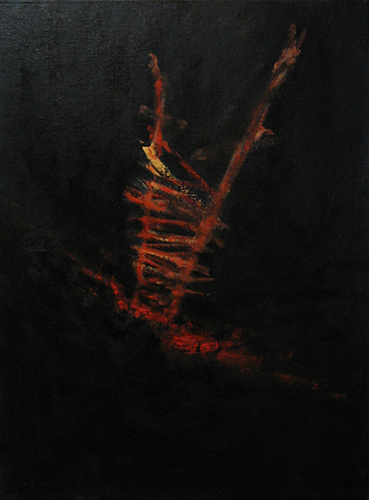 The straightforwardly titled painting is dominated by a large object, glowing red and yellow, sitting on top of an equally glowing red slit – the schism, all of them contrasting strongly against the black background. Smack in the middle of the small canvas, the large object can be seen as an escaping ladder, or a doomed arrow headlong crashing into the schism; or, can even be interpreted as the vary agent who caused the schism, with some tragic results for the environment and perhaps even itself, similar to the reckless behavior of the US on the international stage in the last decade, in particular. This painting, in stark contrasting bi-tones, together with Flow and Party Night, would be exhibited at Expressions Gallery, Berkeley, in an exhibition titled “Does Color Matter?” (October 24, – January 8, 2016 Opening: October 24, 6-8pm).